It was just another day in the life of a small Atlantic resort until the terror from the deep came to prey on unwary holiday makers. The first sign of trouble – a warning of what was to come – took the form of a young woman's body, or what was left of it, washed up on the long, white stretch of beach . 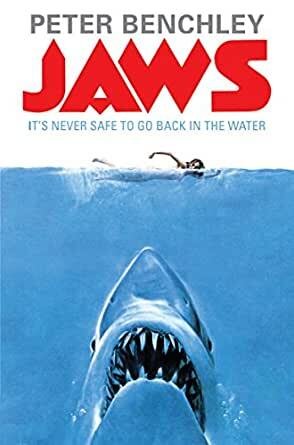 . .
Peter Benchley's Jaws first appeared in 1974. It has sold over twenty million copies around the world, creating a legend that refuses to die – it's never safe to go back in the water . . .
5.0 颗星，最多 5 颗星A great read!! In honor of Shark Week I reread Jaws by Peter Benchley. If you’ve only seen the film (one of the best ever IMHO) the book is worth reading. It is different from the movie in many ways. This was Benchley’s 1st novel and he captured lightning in a bottle. His character development is brilliant as evidenced by how easily they translated to the film version. The characters in the film are the same ... but act and relate to each other a bit differently (a brilliant move by the film makers). His depictions of the “fish”, the attacks and the political havoc wrought on a small seaside town are captivating. The story and dialogue is fast paced. It’s a great read ... even a second time. I can’t remember another book to movie that I’ve enjoyed more than this one. There's no call for a bigger boat here - this is not the same story as the movie version. Generally speaking, yes it is, but the movie took the action storyline from the book and left all else behind. The details left behind are interesting but not *that* interesting - at times they greatly slow an already slow paced story. The pace and all the additional material (life in town; more with the Brody family; a larger group of characters, some with different motivations and fates) means the book is 70% done before people go out after the shark. Still it's a good read, and there *are* surprises in the plot where book and movie differ. I just prefer the movie over the book this time. I was 9 when the movie came out, and have watched it a number of times. A classic. I generally dislike reading a book after I have seen the movie. In this case, it was enjoyable. I appreciated the image I had of the movie characters and setting as I read the book. I also appreciated that the story had an added element of tension and drama that I won't reveal (be careful reading other reviews, some discuss this element openly). That added element has been criticized by some reviewers, but I felt it gave the book another dimension versus the movie, and provides an additional layer of human drama that enhanced my enjoyment of the story. I am not sure why Spielberg and/or others decided to leave it out of the movie, but it does make the movie more focused on man vs. shark moreso than man vs. himself, and I can see the merit from a theatrical perspective. It would be nice to see a movie remake that was more true to the book, a la the TV version of The Shining. Some reviewers a have criticized Benchley's writing abilities, but I found the book to be compelling and well-written. Time well spent, and long overdue. 4.0 颗星，最多 5 颗星The ending. This was a fantastic book that still frightens me after reading it 2 years ago. The ending haunts me still, nothing like what you'd expect. Clearly you saw the movie before you read the book, I just have a hunch, you're going to hate Matt Hooper (Richard Dreyfuss' character) in the book, which is why I gave this book 4 stars, I loved the character in the movie.